Lewis Army Museum | Inspire. Educate. Preserve. The Lewis Army Museum has updated its public access policy. In the past, visiting the museum has required going to the Visitor’s Center on Exit 120 to obtain a visitor’s pass. 1. Take Exit 119 off of I-5. 2. Turn right onto Dupont-Steilacoom Rd. 3. Turn right at the gate (first right beyond small commercial area and hotel) and follow the gravel road up to the parking lot. 4. Park in the parking lot and call the museum by cell phone at 253-967-7206. 5. You will be escorted through the gate to the museum on foot. When your visit has concluded, you will be escorted back to the parking lot. We are excited to be more accessible to the public in order to share the Fort Lewis story with everyone. If you have any questions or concerns, please feel free to message us on Facebook, or call the information desk at 253-967-7206. 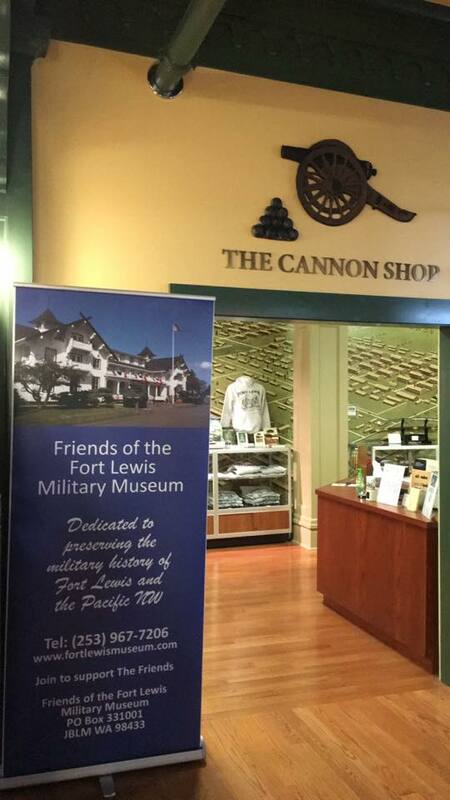 The Cannon Shop gift store is now open from 11:00 am to 4:00 pm. Located in the Historic Red Shield Inn building on Joint Base Lewis-McChord (JBLM), the Lewis Army Museum is the only certified U.S. Army Museum on the West Coast.